Easily one of the best investments we've made in recent years. Our dividend? 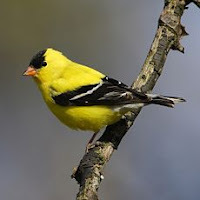 A lively, colorful colony of American goldfinches, aka spinus tristis, Eastern goldfinch or wild canary, who have taken up residence in and around our garden. It's spring, and the gentlemen, in particular, are making their presence known -- quickly trading in their dull ochre winter coloring for a bright lady-pleasing yellow. And although the finches won't nest and start their broods till late June-early July, the guys aren't wasting any time. Although usually somewhat circumspect, using the foliage and branches of the cherry tree for protection, our male goldfinches proudly perch on the top branches of the tree these days, puffed out like feathery lemons. (I counted about 8 a couple of days ago!) They fill the backyard with a light, reedy song -- letting the ladies know they're ready, willing and able. Even our incorrigible gang of sparrows seem a bit subdued by the goldfinches' springtime transformation. At least for now.